Before the business portion of my San Francisco jaunt began, I was able to pencil in some family time with my Bay Area-dwelling cousins: Jessica, Andrew, and Michael. 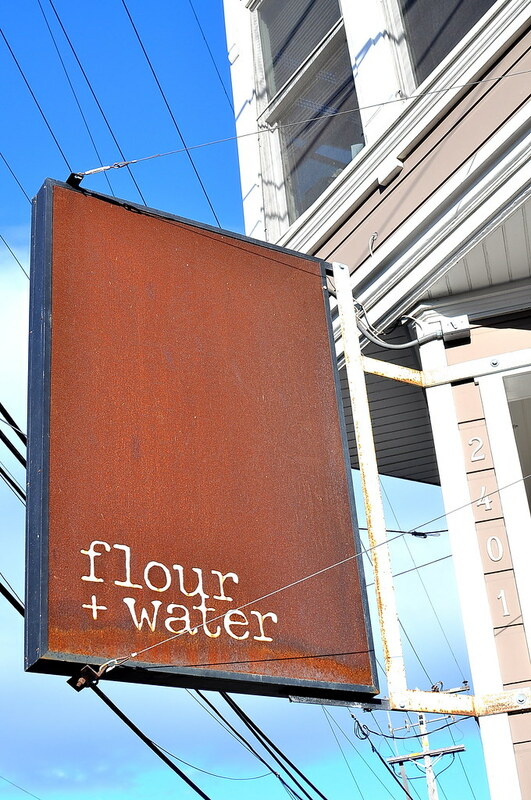 I’ve been desiring a dinner at pizza and pasta powerhouse Flour + Water for years now, and all three cousins were game for a whole lotta carbs. Without advance reservations, our party planned to meet when doors opened at 5:30 PM to avoid waiting for a table. Unfortunately, Cousin Andrew couldn’t escape the grind until past 6, so we were stuck waiting for 2.5 hours (even though we were originally quoted 1.5 hours). It was admittedly a little painful, but we persevered without getting overly peeved. Bread is available only by request; after our lengthy wait, it was highly necessary! 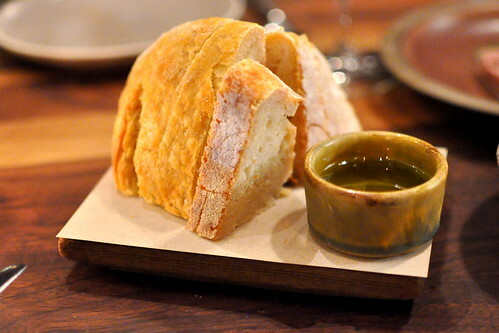 The crusty loaf, with a noticeably doughy interior, was served with grassy olive oil. The entire table loved the Mangalitsa terrina served with whole grain mustard, pickles, and sourdough toast points ($16). 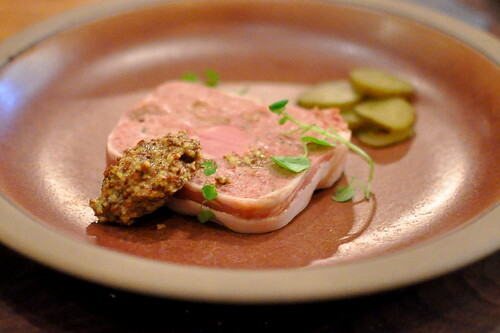 It’s hard to keep a table full of Vietnamese kids away from a slab of pâté…just sayin’. 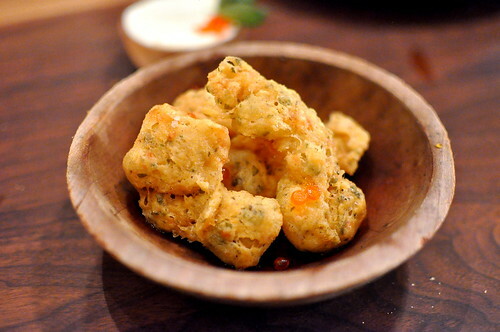 The king salmon zeppole with lemon crème fraiche ($7) didn’t really deliver for me, unfortunately. While I was expecting a classic doughnut-like zeppole, the deep-fried nuggets that arrived were crumbly and airy with not nearly enough salmon eggs. On the flip side, with fewer expectations, Cousin Jessica quite dug this unorthodox deep-fried dough. 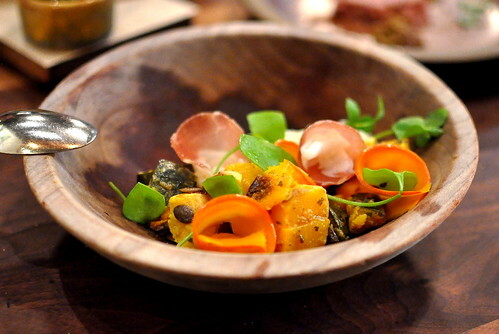 I learned this evening that Cousin Andrew is a squash kinda guy, so we ordered the brown butter-roasted squash with pumpkin seeds and stracciatella ($14). This dish wasn’t particularly thrilling, but it was solid and lovely in its straightforward way, especially the luscious stracciatella. 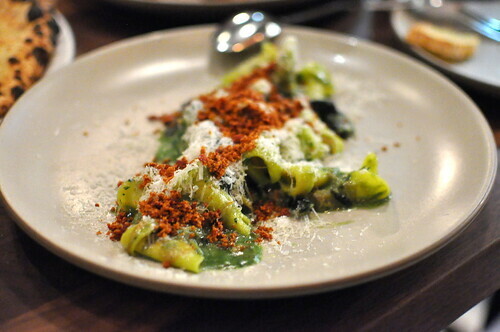 The nasturtium cappellacci dei briganti with braised rabbit, blue chanterelles, and tomato bread crumbs ($19) really delivered. 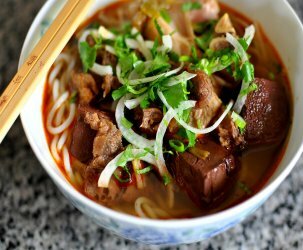 The hearty, textured, and well-balanced toppings suited the hat-shaped noodles just right. 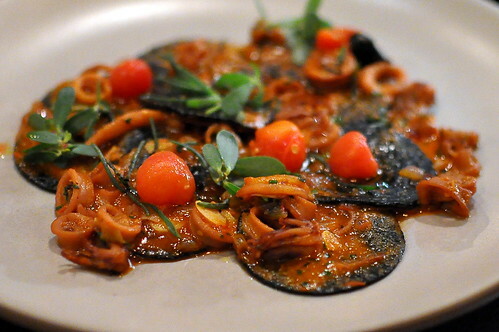 My fave noodle of the night was the squid ink corzetti with braised squid, heirloom tomato, and purslane ($19). The tomato-based sauce was positively zesty with an oceanic undertone that I really dug. The squid was as tender as ever. 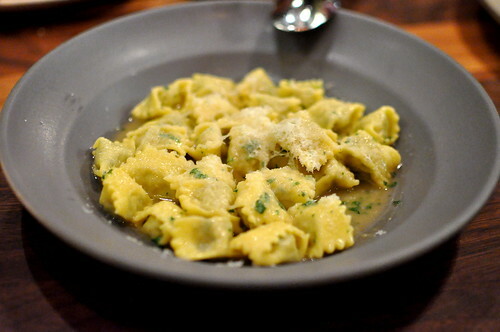 The agnolotti dal plin ($18), jagged-edged parcels stuffed with a trio of braised meats including hen, pork, and beef, was a pleasant addition to our spread. I especially dug its toothsome texture and simple butter sauce. 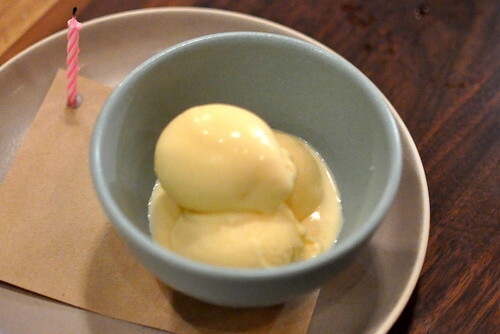 First up for dessert were a few melted scoops of cantaloupe gelato ($8). Neither the flavor nor the texture satisfied this gelato lover. 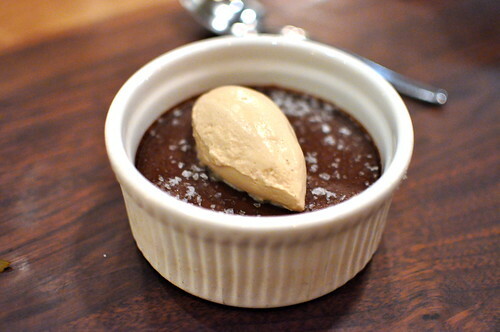 Fortunately, the chocolate budino with ($8) espresso cream and sea salt came through like a champ! The dense, rich, not-too-sweet pudding paired gorgeously with the whipped espresso cream. The salty shards kept our spoons coming back for more. 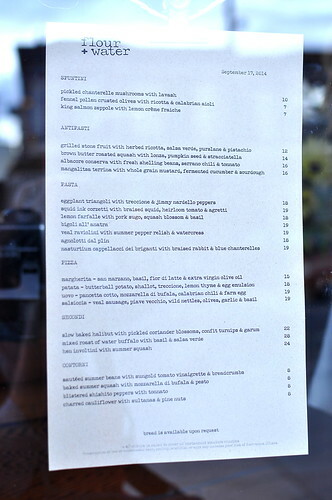 Our dinner at Flour + Water had its high and middling points, but it didn’t deliver the kind of world-rocking, palate-swooning meal that I was hoping for overall. Still, the company was great and the vibes were fun. 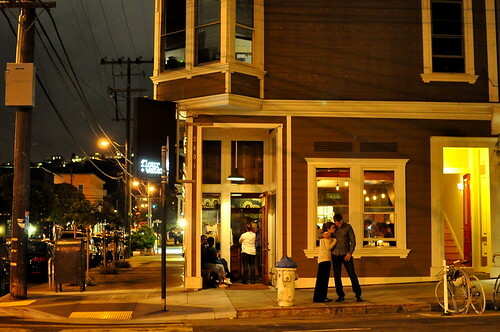 Sotto and Bestia—San Francisco ain’t got nothin’ on you! sounds like a good meal, overall. but not worth the 2.5 hour wait. ; – ) get a reservation or, go elsewhere till you can get a res. Wow, that sounds like a Chicago-like wait! Glad you were able to make it…bummed it didn’t meet expectations. 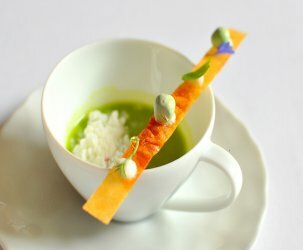 Still love the pastas there though. Lori – We definitely wouldn’t have waited had we known it would be 2.5 hours! Alas, hindsight is 20/20. 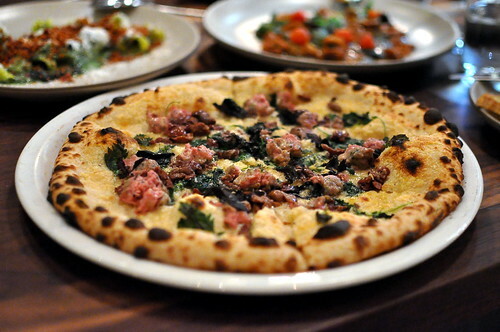 Diana – Definitely go at 5:30 PM and carbo-load! 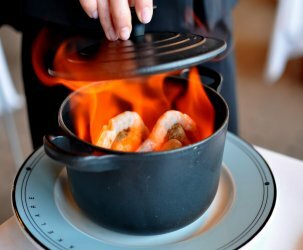 Ah, kind of a bummer that the restaurant wasn’t what you hoped and dreamed. I was thinking about visiting a while back, but a 2+ hour wait for food is a no-go in my book.